'The Railway Children' is one of the most-loved family stories ever written. As a book, a TV series and as a film, the story about a group of young friends who are moved to a house next to the railway after their father is imprisoned, wrongly, for supplying state secrets to the 'other side' seemed to hit home and it has been a success with generations for over a century. 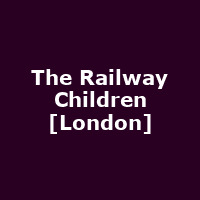 This stunning Olivier award-winning adaptation of E. Nesbit's classic novel 'The Railway Children' is currently playing at London's King's Cross Theatre. Set in a new, purpose built 1,000 seat venue, this breath-taking show features a stage built around a real train track, and a beautiful 60-tonne locomotive that steams into the theatre. Steeped in nostalgia and charm, re-live the heart-felt moment Bobbie gasps 'Daddy my, Daddy' and join Bobbie, Peter and Phyllis on the adventure of a lifetime as they tell the story of how they became The Railway Children. Jul 2011:School's out - things to keep the kids busy for summer 2011 holidays! Special Offer: London theatre Kids Week 2011 will keep your children entertained this summer!